Do you struggle to follow conversations in noisy environments? In group conversations, do you find it hard to follow what each person is saying? Have friends or family suggested that you should have your hearing checked? Do you have hearing aids, but wonder if there is a better solution for your needs? If you answered “yes” to any of these questions, we would love you to be involved in our research study. We have been chosen by Oticon to independently assess whether new range of hearing devices, which are enabled by their superfast new Inium processing platform, achieve higher client satisfaction levels than all previous hearing aids – among both experienced and inexperienced hearing aid users. The Alta (premium), Nera (advanced) and Ria (entry-level) devices incorporate sophisticated technologies to: rebalance hearing; restore clarity to conversations; and turn down distracting background noise. They can even transform into wireless headsets, offering incredible stereo sound when paired with mobile phones, televisions and a range of other devices. 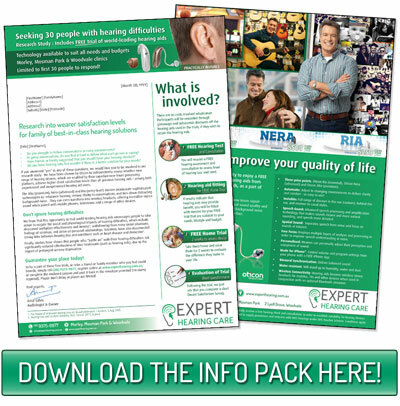 FREE HEARING TEST: You will receive a FREE hearing assessment and consultation to assess level of hearing loss and need. Hearing aid fitting for free home trial: If results indicate that hearing aids may provide benefit, you will be fitted with devices for your FREE trial that are suitable to your needs, lifestyle and budget. FREE HOME TRIAL: Take them home and wear them for 2 weeks to evaluate the difference they make to your life. Call Expert Hearing Care on (08) 9375-9977 or use the form below to schedule your free home trial.